Every Muharram, we gather to hear the stories we know by heart, the stories that we feel deep within us. We hear the stories of the incomparable people that accompanied Imam Hussain (AS) to his final stand. We mourn for them. We cry for them. Their names are enough to remind us of their pain. The companions that Imam Hussain (AS) had were of the highest levels of faith and loyalty. They spent their lives serving the Imam (AS). But how do we remember them in our lives? What can we learn from them? 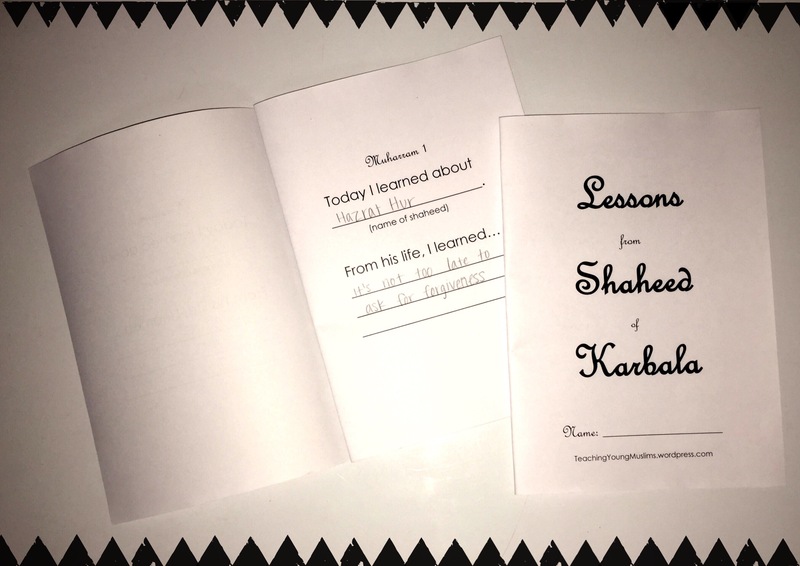 As we attend the majlis this Ashra, let’s take a lesson from each shaheed/martyr of Karbala, and apply those lessons to our lives. Let’s teach our children to aspire to be like the companions of Imam Hussain (AS) and support our Imam (AS) in the best way possible. In this book, there is a space for your child to write the name of the shaheed that they learned about each day. Underneath that, there are blank lines on which they can write the lessons learned from their life. Opposite the page for each day of the first Ashra of Muharram, there is a blank page. They can use that page to take notes from the majlis. They can also use that page to elaborate on the story of the shaheed. If there is more than one shaheed on a day, they can use that space to talk about another lesson that they learned. I hope this is a helpful addition to your child’s Muharram/Majlis experience this year! If you found this useful, please let me know below in the comments section or on facebook.